Join Hemlock Restoration Initiative Director Margot Wallston for a walk around the Botanical Gardens of Asheville. Since HWA arrived in the area in the early 2000s, the Botanical Gardens of Asheville has been active in managing its hemlocks. As a result, the gardens are full of healthy hemlocks for everyone to enjoy and serve as a wonderful example of what good hemlock management can achieve. This informational walk will give participants ‘on the ground’ experience with identifying North Carolina’s two native hemlock species, assessing tree health and deciding how best to manage hemlocks on their own properties. 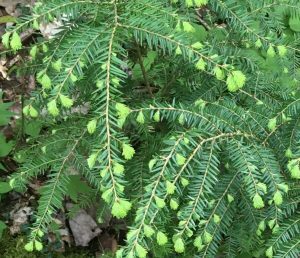 The HRI will discuss what governments and conservation organizations are doing to restore hemlocks to long term health in our state, highlight an integrated, multi-pronged strategy for hemlock conservation and let folks know how they can get involved in native hemlock conservation. The walk will take place on Sunday March 24th at the Botanical Gardens of Asheville. In the case of inclination weather a classroom style lecture will be held at the Botanical Gardens in the same time slot. PRE-REGISTRATION and PRE-PAYMENT to the Botanical Gardens of Asheville is required for all classes. Cost for the workshop is $15 for members, $20 for non-members. To register and pay by credit card, please call (828) 252-5190 during Visitor Center hours or M-F from 11 am to 3 pm. Alternately, you may register and pay in person with cash or a check during Visitor Center hours. For more information about programs at the Botanical Gardens of Asheville please visit the Botanical Gardens website.